A falling building, shaking ground and people running in all directions can be seen in a new video that has emerged online showing some minutes of the devastating earthquake that struck Nepal’s capital, Kathmandu, and the surrounding area. 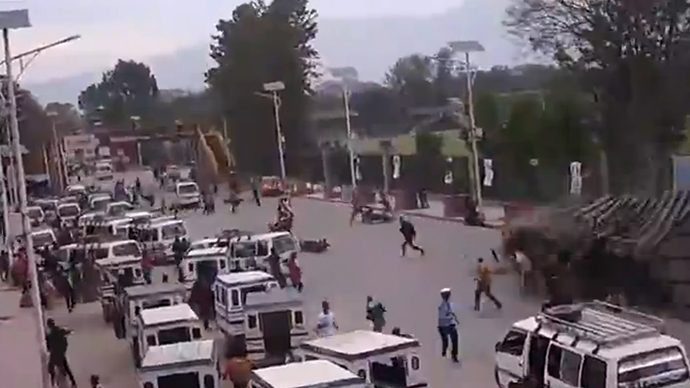 The footage shows a busy road in Kathmandu. Then suddenly the ground begins to shake and the near-by building falls to the ground apparently killing and injuring passers-by. Some people are seen running to where the building fell and trying to help the survivors. Seconds before the quake the scene was serene, but the shaking ground threw up thick dust clouds. On Wednesday, Nepalese police confirmed the death toll following the powerful earthquake had passed 5,500. In Bangladesh and India, 61 people have been killed, while China’s Xinhua news agency reported that at least 25 people lost their lives in Tibet. On Tuesday, Nepal’s Prime Minister Sushil Koirala said the final toll could reach 10,000. 2.8 million people are believed to have been displaced by the quake, while more than 70,000 homes have been destroyed, a figure which is expected to rise.